The Laugh Factory features a rotating roster of established comedians and new rising stars of comedy. Famous comedians who have performed here include Eddie Murphy, Richard Pryor, Jim Carrey, Dave Chappelle, Dane Cook, Rodney Dangerfield, Ellen DeGeneres, and Phyllis Diller. And so many more. Book now for a night of laughs. Watch the hottest comedians nightly at the Laugh Factory. The Laugh Factory has been a starting point for many successful comedians and is recognized as “The No. 1 Comedy Club in the Country” by USA Today. The Laugh Factory is where many of the top comedians got their start in Hollywood. They have had many of the top-name performers on their stage like Tim Allen, Roseanne Barr, Jeff Foxworthy, Chris Rock and many more. Now Hollywood’s Laugh Factory has come to the Tropicana and features some of the most popular comedic acts in the country. 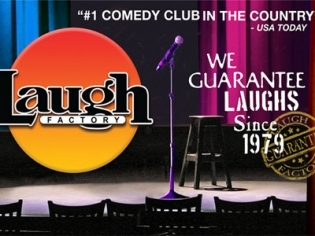 The Laugh Factory Las Vegas is the place to go for an evening filled with laughs and fun. Andrew Dice Clay is a featured performer. The talent changes nightly so be sure to stop by and check the latest act before they hit the TV circuit! They have featured comedians that are on their way up and you will be talking about seeing them in person. The small 320-seat venue is perfect for stand-up routines because there is not a bad seat in the house! The friendly staff will keep the delicious cocktails coming for your enjoyment. Ticket prices are reasonable for such a fun-filled evening. There is usually a host, a featured performer and the headliner. The laughs just keep coming all evening long. VIP seating is available. Enjoy the Midnight Dirty Show on Friday and Saturday nights. I had a really good time here. The comedian I saw was great. You really cant go wrong, and the prices are good. I’d come every week if I could. I laughed so hard that I thought for sure I was going to Pee my Pants! My cheeks hurt so bad by the end of the night I couldn’t even smile! I really appreciated the small venue because it made it so much more personal! Great Time!!! The venue is small and has table seating which is a nice change from the typical auditorium seating seen most places. If a show doesn’t sell out, they upgrade seats and move you closer to the stage. Make sure to check on the comedian before purchasing tickets. They change regularly and their humor varies from PG to R.